I love this movie. It was actually filmed in Rome, not a backlot somewhere. 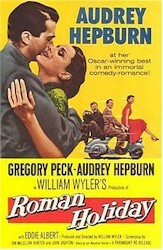 It was Audrey Hepburn's first starring role in a major film and she won an Academy Award for her performance. A true icon.